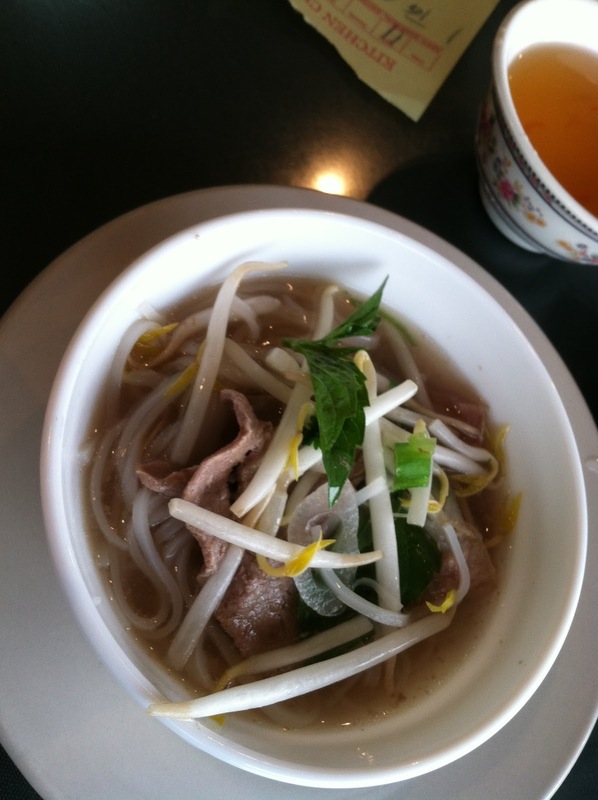 La Belle Boulangerie: Mo' Pho fo me! 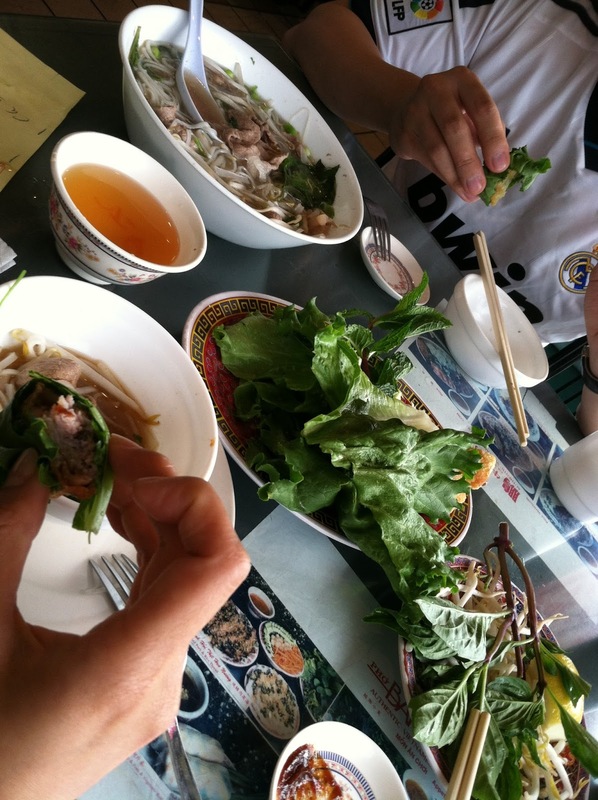 I've never been much of a fan for Viet food, possibly because I've never really eaten it except for the odd Viet sandwich in Chinatown. 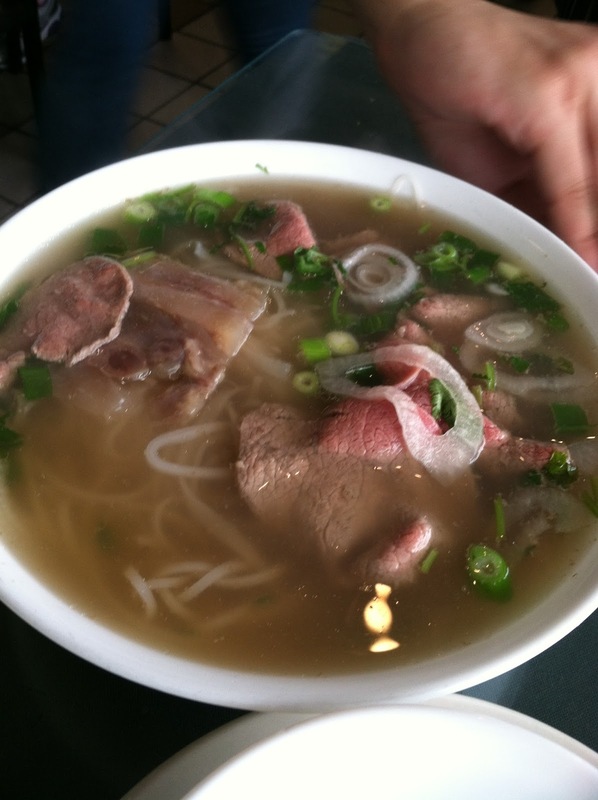 Today we ventured into the heart of Elmhurst to try Pho Bang, the ultimate Pho place in Queens. The red awning was hard to miss - you could spot it from two blocks away. From the outside, this place isn't much of a place, with dust and grime covering the windows. Actually from the inside, it isn't much to look at either, with a round tables filling up the room. 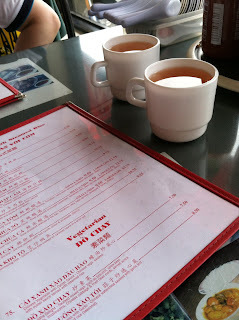 We were greeted, seated and served tea in under a minute. It was probably a family (large family that is) run joint, as there were 7 waiters on the floor, and 3 dining at a table near the back. After we were seated, at least 2 waitresses asked for our order in less than 5 minutes. Guess they're trying to usher in more customers on Father's Day. 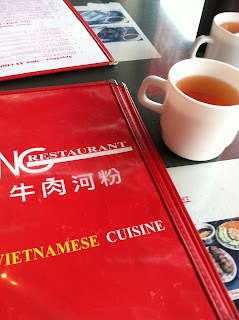 I let hubby do the choosing, since I was much of a Viet food connoisseur. We ordered a large beef brisket and tendon soup ($6.75, large one is only $0.50 more than the regular size), and some fried Viet spring rolls. I had the misfortune of using their washroom. Let this be a warning to all who dare to venture into that domain - do not, I repeat, do not, use it. It will only ruin your appetite. Be warned. 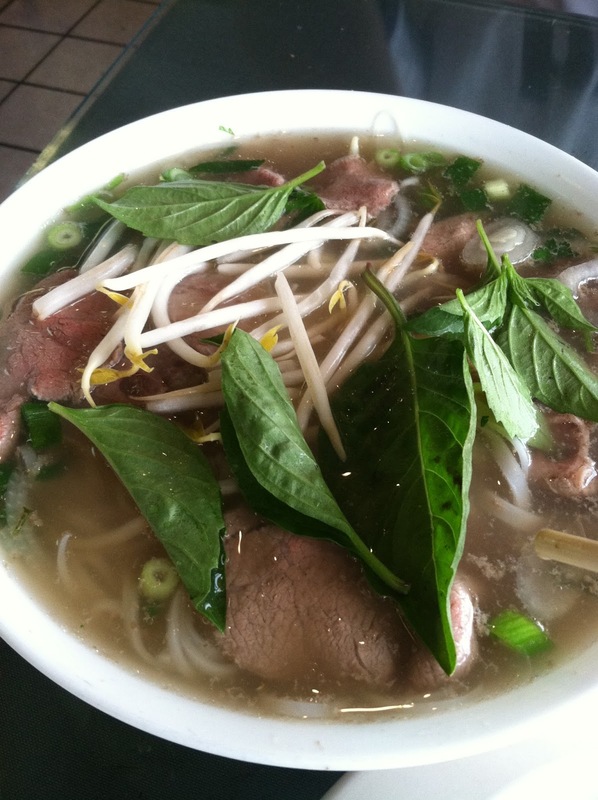 The pho came in less than 5 minutes flat. The large bowl was filled to the brim with noodles, half-rare beef brisket and tendons, and pieces of green onion roots floating over the top. This immediately made up for the bathroom trip. 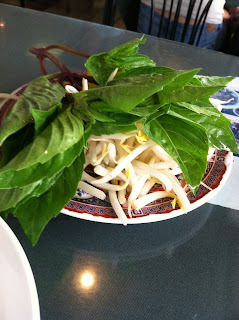 The plate of bean sprouts also comes with a quarter of a lemon. 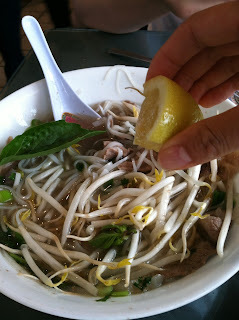 I squeezed some into the pho to add a tang of fresh lemony zest. This added more flavor and freshness to the already savory soup base. I really liked the broth, because it was flavorful yet not overpowering like a lot of Chinese ramen soup bases. 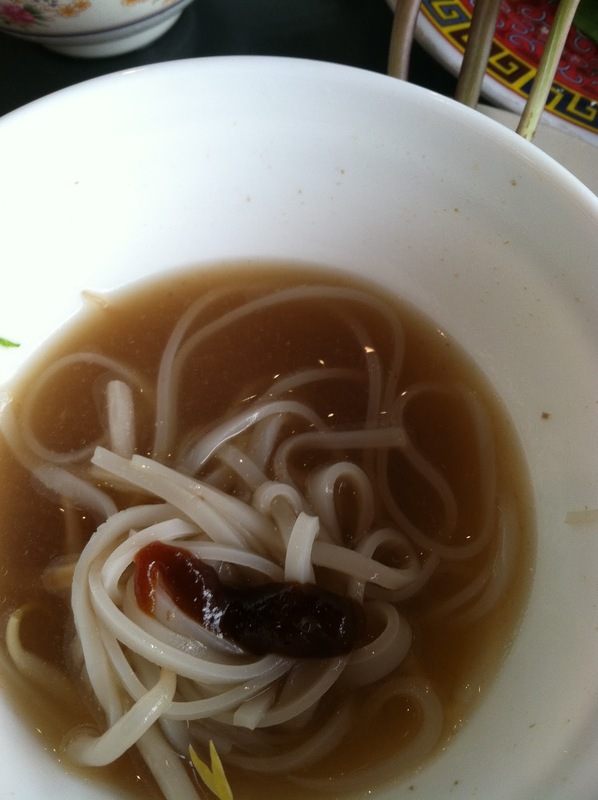 The meat was plentiful and tender, even after it is soaked in the broth for a long time. 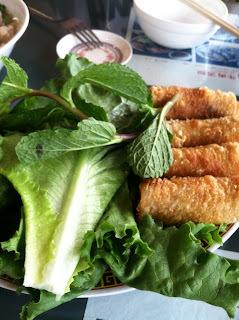 The spring rolls came right afterwards. It came on a plate of lettuce and mint leaves. I picked one up and bit into it - it too was filled to the brim with goodies - pork, beef, shrimp and mushroom grinds. Hot n crispy on the outside, soft and flavorful on the inside. What more could you ask for? 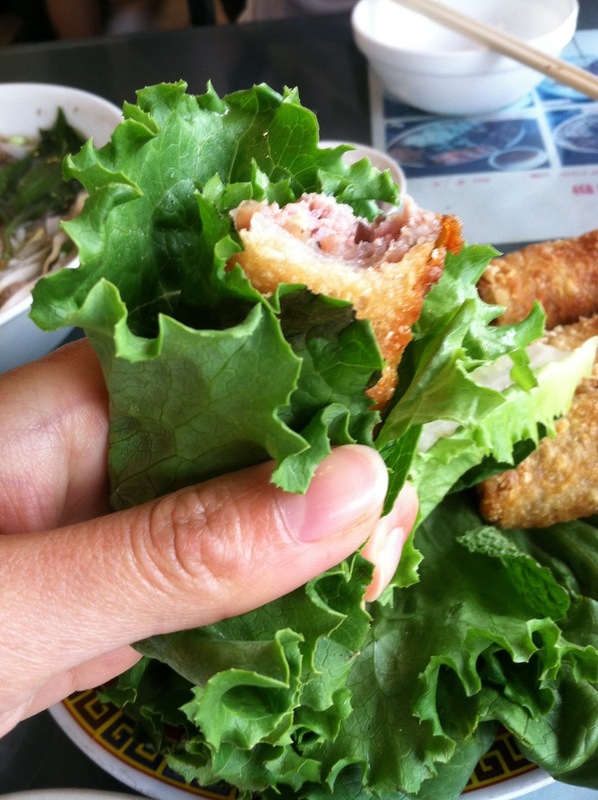 Oh yes, there is one thing you should know about the rolls - it is meant to be eaten inside the lettuce like a peking duck wrap without the duck or the crepe. You can also stick a piece of mint leaf inside for more flavor. I didn't know this until half way into my first roll. Hubby and I had trouble finishing the large bowl of pho, even though we only ordered like two things from the menu. I would say the pho was priced very, very reasonably, but I couldn't say the same about the spring rolls, which were around $5 for four rolls (granted, for the taste it was worth it). For the price and taste, this was definitely waaaay better than the pho we had in Paris. ...until we cleared our plates! The bill came out to be $12, which was amazing for the amount of food that we ate. 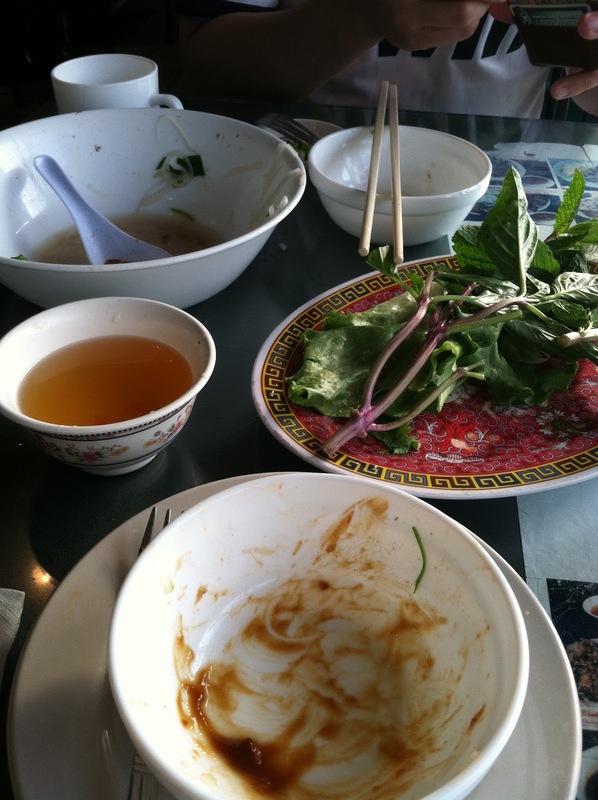 You can be sure that I'll be back here fo mo pho!